Ever since I was a little kid I’ve loved cream of mushroom soup. Mushrooms are powerhouse sources of nutrition. They are rich in selenium, b vitamins, and copper, plus they are great sources of fiber and protein. In this yummy recipe I used cremini mushrooms for the base and shiitakes for the garnish. Shiitake mushrooms are pretty special when it comes to overall health and vitality. For centuries they have been considered a healing food in Asian cuisine. Modern science confirms that shiitakes heal chromosome damage caused by anti-cancer treatments, boost immunity, reduce cholesterol and support cardiovascular health, have hypolipidaemic effects that promote weight loss, and are a good source of vitamin d.
But, beside all of the science about mushrooms, I eat them because they are just plain old DEEEEEELICIOUS! I love the texture, I love the flavor, and I love the deep umami satisfaction my body feels after eating them. You can read more about umami here: Do you crave umami? 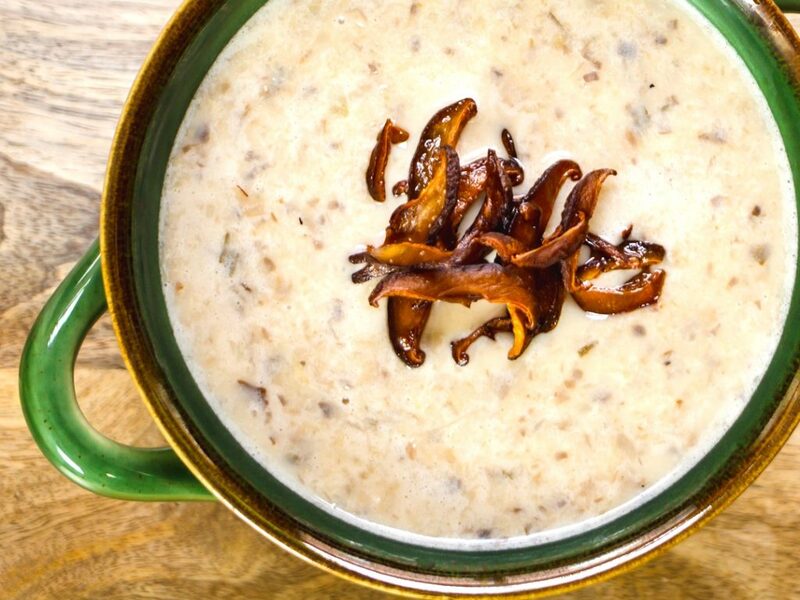 If you love mushrooms, I know you’re going to enjoy this recipe. For those of you that are dairy free, just omit the cream/milk and it’ll still be totally yummy! In a soup pot, on a medium high heat, saute the onion in 1 tbsp. olive oil and butter, plus a couple of pinches of salt, for 2-3 minutes. Add the mushrooms and tarragon, cover and cook 5-7 minutes. Add the chicken stock and 1 tsp. sea salt and bring to a boil. Cover and reduce heat to simmer for 10 minutes. Add the ingredients back into the soup pot with the black pepper and heavy cream. Gently simmer the soup for 2-3 minutes. Do NOT bring back up to a boil.